Vladimir MIKULKA follows in the traditional line of Czech musicians who have issued forth from Bohemia the land that has earned the nickname "Conservatory of Europe". This is by virtue of its long history of musical culture and for giving the world so many outstanding musicians. The Czech Republic, as it is to-day, whose greatest river the Moldau inspired B. Smetana to compose his unique cycle of symphonic poems "My Country", has also been in the past the birth place of many families of musicians. These include the Bendas, Dusheks, Dusiks, Vanhall, Kozeluh and Myslivecek who left their homeland and established themselves in Germany and Austria or, in the case of the Rejcha, in Paris. Vladimir MIKULKA was born and grew up in Prague close to the Vltava and Charles Bridge on Mala Strana. He took up the guitar at the age of 13 and soon became, due to his rapid progress, a student of Professor Jiri JIRMAL at the State Conservatory. While still a student he won, at the age of 19, in 1970, the Concours International de Guitare in Paris organized by Radio France. He then started his concert career plus recording for French radio and TV and soon began to travel to other countries. Since then he has been invited to give concerts and master classes in all the continents of the world. Vladimir MIKULKA has given many first performances, both on CD and on stage, of works written for or dedicated to him. Among these, most famous is the suite "The Prince's Toys" by Nikita Koshkin first performed in the Grand Auditorium of Radio France in 1980 and thereafter recorded on CD for BIS. ("This is the most important recording of guitar music in many years. It is a landmark in he history of the guitar." GRAMOPHONE GB). Vladimir MIKULKA has also been the first interpreter of numerous compositions by his compatriot Stepan RAK and dedicated to him a CD which was declared a "unique discovery" by the French music review: Diapason. ("Mikulka plays Rak" for GHA). There followed further composers such as Pierre Ancelin, Michai'l Rudnev, Milan Tesar and Antonio Ruiz-Pipo in the CD "European Premieres", and others such as Patrice Sciortino, Einojuhani Rautavaara and John Duarte. Vladimir MIKULKA also ventures into the field of transcription resulting in a series of works by Czech composers such as Dussek, Vanhall, Kozeluh, Jelinek (CD "Classics from Bohemia" GHA). In his collection of guitar music for Editions H. Lemoine entitled " Vladimir MIKULKA presents..." there are to-day up to fifty works for guitar, solo and chamber, embracing "the old" and "the new". 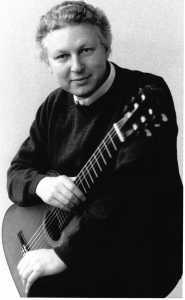 The Video tape entitled "MIKULKA Live in Prague" which was recorded by Czech TV during a recital at the "Mirrors Hall" of the Klementinum, is an example of Mikulka's extensive repertory and mastery of the guitar. ("You have here a Mikulka live, always very personal, profound and of a stunning mastery" Les Cahiers de la Guitare - France). In 1982, with his native country being firmly established under the socialist regime, Vladimir MIKULKA chose France as his new home and naturally Paris where, years before, he started his international career. Today, in addition to his continuing concert activity, he teaches at the Conservatoires de la Ville de Paris and at the well-known Schola Cantorum where his students can obtain the "Virtuoso" Diploma as well as that of "Concert Performer" while exploring the universe of the guitar. anything by means of understatement, with a quiet concentration which draws an audience to the heart of every piece. He has a lovely range of tone colours at his command, the softest of which reached the back of the Wigmore Hall quite effortless!" "We have experimented a magic musical evening, an extraordinary display of the art of Guitar playing. Vladimir Mikulka belongs to the world guitar high class. What a concentration, what a richness of fantasy and colours, what an aristocracy flows from his playing!" "With a commanding technique, an endearing personality and an armful of interesting music, Mikulka has the resources to become a popular concert attraction in this country!" everything he does with elegance and polish." Whether conoisseur, amateur or mere music lover, the audience was mesmerized by Vladimir Mikulka's boldness. Due to his virtuosity he was able to get the impossible out of his instrument. He has proven that the guitar could become an orchestra in itself, that one can give it the dimension that once was the dream of great Maestros before him. His program was also very original and the choice of the pieces largely participated to the success of the performance." "Magic evening with Guitarist Vladimir Mikulka__with an extreme concentration he enraptured the audience by his absolute command of the instrument and his delicacy of execution. Total enchantment......three encores and a standing ovation greeted this exceptional artist." "... The programme was intelligently put together and, most of all, Mikulka is a true musician... a goldsmith's precision... As for his technique it must be transcendent: otherwise how could he manage the melody so independent from the accompaniment and so limpid the polyphony and so sustained the legato ? to a truly grand guitarist."